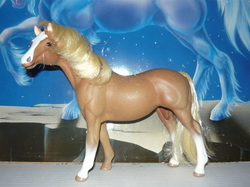 Misty's Flame-1998 flaxen chestnut sabino. Sired by Cezanne (r), out of Misty's Heatwave (r). 2003-Artemis SA, chestnut splash filly (x Phantom Mist -r) o/b Ariel Williamson. 2011-Crimson Flame, bat sabino colt (x Crimson Sea) o/b Nick P. Stokes. Silver Seas-2003 bay silver. Sired by Surfer Dude (r), out of Island Breeze (r). 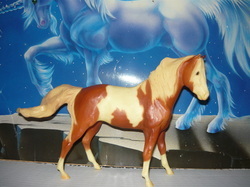 Splashin Mist-2003 flaxen chestnut tovero (tobiano & splash). Sired by Night Mist (r), out of Adams Bruna Pr (r). 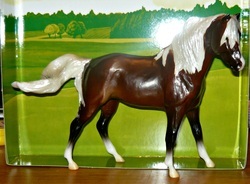 Wild Hurricane-2007 liver chestnut tobiano. Sired by Wild Thing (r), out of Thetis (r). 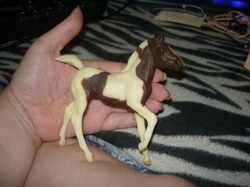 OF Breyer Classic Andalusian foal.